Eagles fan Chuck Soloman plans to cover his whole head with tattoos representing the team. The bald Eagles fan best known in Philadelphia as "Tat Man" is hard at work covering virtually his entire body with team-related art. He's now moved onto his head. 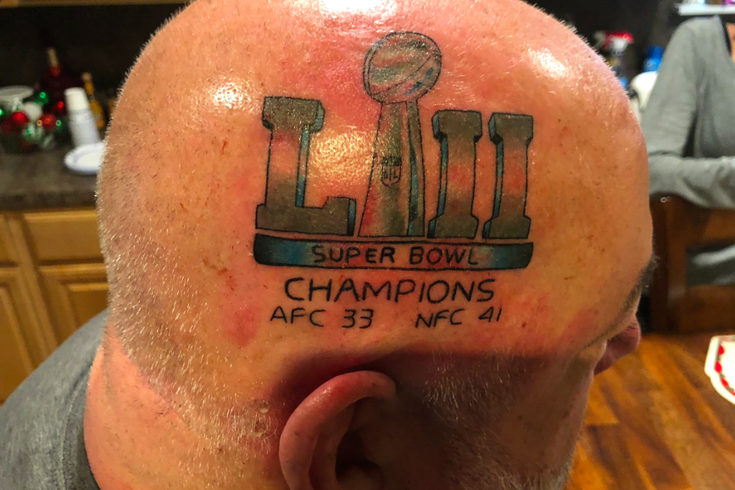 Chuck Soloman, who has more than 100 tattoos dedicated to the Eagles, recently got the Lombardi Trophy and Super Bowl LII logos completed on both sides of his head. It's just the beginning, according to Soloman. Featured this week in Inked Mag, Tat Man's body has become a testament to Eagles history over the years. Some of it is fairly obscure and almost certainly was done on pure impulse. In addition to a Kevin Kolb tattoo, the 48-year-old business owner has tributes to Mike Quick and Eagles team reporter Chris McPherson. His stomach features the implosion of Veterans Stadium and at least a half dozen player signatures that were made permanent overtop the autographs. It's anyone's guess what the rest of the head tattoo will feature, but considering the quality of some of his other tattoos, we can probably expect it will turn out well.